Volkswagen (VLKAY (VLKAF and Ford Motor (F - Get Report) continue to make moves together, as these long-time automotive stalwarts look to further their automotive tech advances with one another. During this year's Detroit Auto Show in January, Ford and Volkswagen announced a global alliance centered on commercial vans and trucks. The move was intended to increase global reach, drive down costs and improve efficiencies. However, the announcement followed months of reported talks between the two automakers, with expectations for a larger partnership in the future. While the two may have more partnerships in the pipeline, Ford and Volkswagen have taken another step forward in unison, this time with autonomous driving. Volkswagen will reportedly invest about $1.7 billion with Ford's Argo subsidiary, with $600 million slated for Argo equity and the remaining $1.1 billion being used for working capital in the new joint venture. Eventually, it wouldn't be surprising to see Volkswagen and Ford working together on electric vehicles and mobility solutions as well. However, we shouldn't overlook the autonomous news. Ford/Argo has been slow to attract other parties to the investment table. At least in a serious enough manner where a deal gets done. Consider that General Motors (GM - Get Report) bought Cruise for roughly $1 billion in August 2016 and has attracted investments from both SoftBank (SFTBY and Honda (HMC - Get Report) that left Cruise worth $14.6 billion, vastly more than what GM paid for it a few years back. Is the same outcome in the cards for Argo? It could be, but it will need to bring more parties to the table to get there. With Volkswagen on board, that's a positive first step as its valuation now swells to $4 billion after Ford paid ~$1 billion back in August 2017. It's unclear how and to what capacity the two automakers working together could accelerate Argo's self-driving technology. But investors shouldn't forget that, while Ford isn't the largest automaker in the world, Volkswagen is. Or just about. The automaker delivered almost 11 million vehicles last year and aside from the Volkswagen brand, it also owns brands like Audi, Porsche, Lamborghini, Bentley, Skoda and Bugatti. Ford and Volkswagen teaming up isn't that surprising, particularly given the alliances we have already seen. As mentioned, we have the Cruise-SoftBank-Honda alliance and there's also Daimler (DDAIF and Nvidia (NVDA - Get Report) working together. Then there's Alphabet's (GOOGL - Get Report) (GOOG - Get Report) Waymo -- considered by many as the autonomous driving leader -- that could work others like Fiat Chrysler (FCAU - Get Report) , Nissan-Renault-Mitsubishi and Jaguar in some less investment-specific ways. 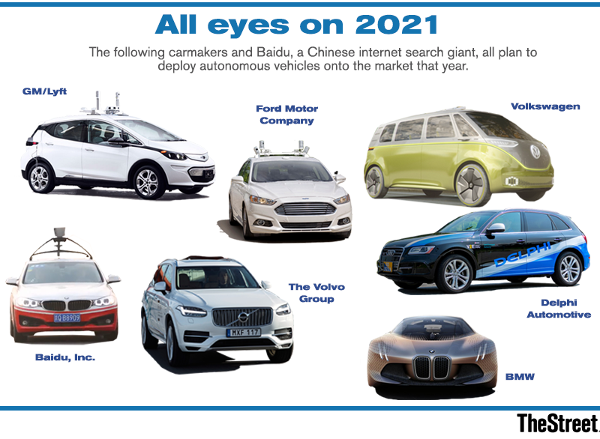 So while Ford or Volkswagen surely would have loved to be leading the self-driving pack all on its own, teaming up to make up some ground may be automakers' best bet.